India is estimated to have the highest snakebite mortality in the world. Snake bite is one of the accidental cause of morbidity and mortality in India. Among various venomous snakes, in India most of the deaths occur due to Russel's viper (Daboia russelli) and saw-scaled viper bite (Echis carinatus). ,, The estimated total of 45,900 national snakebite deaths in 2005 constitutes about 5% of all injury deaths and nearly 0.5% of all deaths in India. 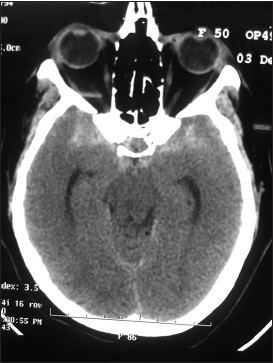 Viperine bite is usually associated with coagulopathy in the form of local cellulitis, mucosal and cutaneous bleeding,  acute kidney injury and rarely intracerebral hemorrhage, but subarachnoid hemorrhage is very rare. Our patient was suffering from subarachnoid hemorrhage following Russell viper bite. A 56-years-old nondiabetic nonhypertensive female resident of rural area of West Bengal was admitted to the emergency department of our hospital with a history of Russell viper snake bite over left foot while working in paddy field 8 hours back followed by development of severe holocranial headache, vomiting and deterioration in the level of consciousness over a period of 2 hours before attending hospital. There was no history of seizure, cranial nerve involvement symptoms like ptosis or lower bulbar symptoms as described by her relatives. Past history and family history were non contributory. On general survey she had pulse rate of 68 beats per minute, blood pressure was 124/86 mm of Hg and respiratory rate was 15 per minutes. Local site of bite showed redness, marked edema and two fang marks. There were no other findings of systemic bleedings from any other parts of the body. The patient was poorly responsive to external stimuli with Glasgow Coma Scale (GCS) of 8/15. Further neurological evaluation revealed bilateral nonresponsive plantar response. Patient had unequal pupil size and also reacted sluggishly to light bilaterally. Fundoscopy examination revealed bilateral blurred disc margin without any evidence of hemorrhage. Other systemic examinations are largely non-contributory. Her blood was found to be incoaguable even after 20 minutes Whole blood clotting time test (20WBCT). 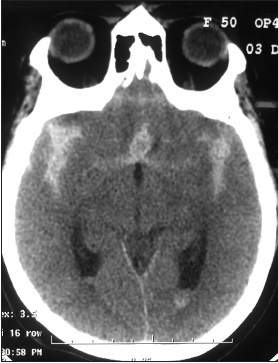 Immediate unenhanced computed tomography of brain (NCCT of Brain) was ordered which showed diffuse subarachnoid hemorrhage [Figure 1] and [Figure 2]. Patient was treated immediately with 10 vials of polyvalent antivenom serum (AVS) given over 1 hour, and repeated with 10 vials after 6 hours as the 20 WBCT was abnormal as per WHO guideline of snake bite year 2010. The 20 WBCT normalized subsequently, though the headache persisted without any neurological deficit. Patient was transferred to critical care unit with regular monitoring of the vitals. Patient was treated with mannitol, oral nimodifine and other supportive care as per standard protocol. Routine laboratory investigations revealed a hemoglobin count of 7600, with 78% neutrophils, platelet count of 150000/mm 3 . Other biochemical parameters like electrolytes, renal function test, liver function test, blood sugar (fasting and postprandial) were within normal limits. Cogulation profile showed prothrombin time (PT) of 13.8 seconds (control 12 s), International normalized ratio (INR) 0f 1.28. Activated partial thromboplastin time (APTT) was 34 seconds (control = 35 s). Fibrin degraded product and D-dimer were 5.6 μg/mL and 1556 ng/mL respectively. Routine urine examination showed microscopic hematuria without any hemoglobinuria. Patient showed gradual improvement in the clinical courses with conservative management. 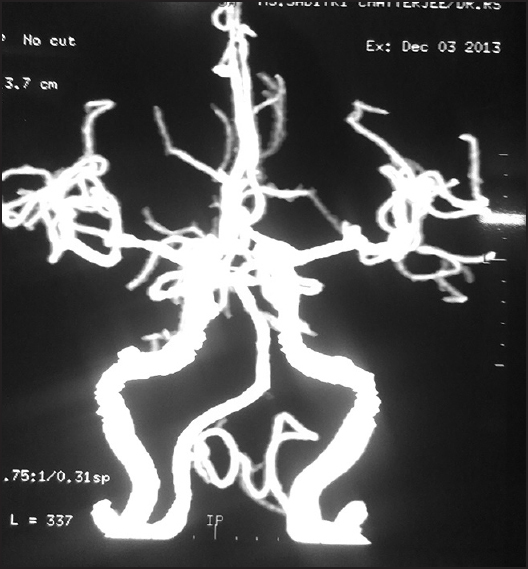 A Magnetic Resonance Angiography (MRA) of brain was done which showed normal vascular anatomy without any structural defect [Figure 3] and [Figure 4]. She was later discharged as her symptoms had improved and was put on regular follow up in our outpatient door. Though PT and activated partial thromboplastin time were normal, elevated fibrin degradation product and D-dimer suggested disseminated intravascular coagulation, which might be the cause of haemorrhage. Coagulation abnormality and vascular endothelium damage are responsible for various complications in viper snake bite. Our patient had history of snake bite who presented to us with local features of envenomation and subarachnoid hemorrhage. It is extremely rare to bleed only at subarachnoid space, due to disseminated intravascular coagulation hence we are reporting the case. High index of clinical suspicion is needed for early diagnosis and timely management which can improve survival of the patients. David AW. New Delhi: World Health Organisation, Regional Office for South-East Asia region; 2005. Guidelines for the clinical management of snake-bites in South-East Asia region; p. 1-77. Brunda G, Sashidhar RB. Epidemiological profile of snake-bite cases Andhra Pradesh using immunoanalytical approach. Indian J Med Res 2007;125:661-8. 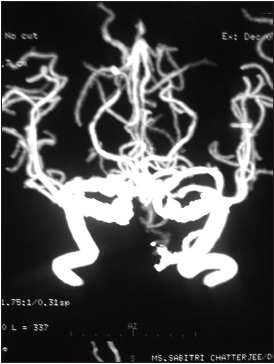 Narang SK, Paleti S, Azeez Asad MA, Samina T. Acute ischemic infarct in the middle cerebral artery territory following a Russell›s viper bite. Neurol India 2009;57:479-80. Mohapatra B, Warrell DA, Suraweera W, Bhatia P, Dhingra N, Jotkar RM, et al; Million Death Study Collaborators. Snakebite mortality in India: A nationally representative mortality survey. PLoS Negl Trop Dis 2011;5:e1018. Warell DA. Animal toxin. In: Cook G, editor. Manson′s Textbook of Tropical Disease, 20 th ed. London; ELBS, WB Saunders; 1996. p. 483. Lee BC, Hwang SH, Bae JC, Kwon SB. Brainstem infarction following Korean viper bite. Neurology 2001;56:1244-5. Boviatsis EJ, Kouyialis AT, Papatheodorou G, Gavra M, Korfias S, Sakas ES. Multiple hemorrhagic brain infarcts after viper envenomation. Am J Trop Med Hyg 2003;68:253-7. Cortelazzo A, Guerranti R, Bini L, Hope-Onyekwere N, Muzzi C, Leoncini R, et al. Effects of snake venom proteases on human fibrinogen chains. Blood Transfus 2010;8 Suppl 3:s120-5. Warrell DA, Davidson NMcD, Greenwood BM, Ormerod LD, Pope HM, Watkins BJ, Prentice CR: Poisoning by bites of the saw-scaled or carpet viper (Echis carinatus) in Nigeria. Q J Med 1977;46:33-62. Isbister GK. Snakebite doesn′t cause disseminated intravascular coagulation: Coagulopathy and thrombotic microangiopathy in snake envenoming. Semin Thromb Hemost 2010;36:444-51.
WHO Library Cataloguing-in-Publication data Warrel, David A. Guidelines for the management of snake-bites. Warrel DA, Arnett C. The importance of bites by the saw scaled or carpet viper (Echis carinatus): Epidemiological studies in Nigeria and a review of the world literature. Acta Trop 1976;33:307-41. Greer JP, Forester J, Paraskevas F, Glader B, Arber DA, Chapter 58. Wintrobe′s Clinical Hematology. 12 th Ed. Lippincott Williams & Wilkins; p. 1436.